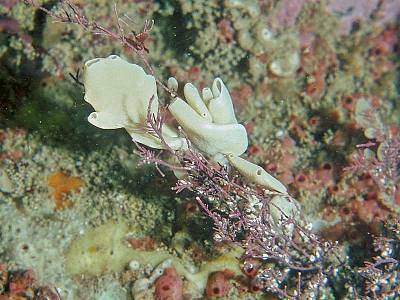 Description: This sponge is usually white to cream in colour but occasionally pale brown individuals occur. It is flat, like a small hot water bottle and open at one end, it may also be tubular, or composed of contorted flat lobes, with a very short stalk. The surface of the sponge is smooth and clean. Habitat: Usually found on the low shore beneath overhangs, but is also common in the shallow sublittoral attached to kelp stipes or other algae. Distribution: A common species on all coasts of the British Isles. Similar Species: This species may be confused with Scypha ciliata which is also whitish in colour and tubular, however in S. ciliata the surface is hairy and there is a crown of spicules around the open end of the tube. Flattened , tubular sponge, open at one end. Picton, B.E. & Morrow, C.C. (2016). Grantia compressa (Fabricius, 1780). [In] Encyclopedia of Marine Life of Britain and Ireland.